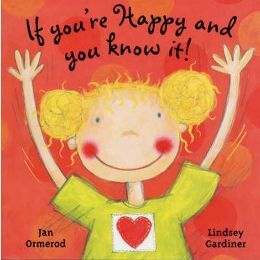 ‘ If You’re Happy and You Know It!‘ by Jan Ormerod, illustrated by Lindsey Gardiner is a really fun book to share with little children. It is based on the popular children’s song ‘If You’re Happy and You Know it Clap Your Hands’ which leads children to perform a number of different actions to show that they are happy. This book follows the same lines but has many alternative suggestions! It starts with a little girl singing the verse that we all know because she feels happy! But before she gets to the end of the verse she is interrupted by a small brown dog that has a different suggestion – he thinks that if you are happy and you know it you should wave your tail – which is of course quite what you would expect a dog to say. However, it does not stop there because throughout the book we come across an array of animals that all have their own ideas about what you should do to show that you are happy. These ideas often illustrate the distinctive features of the creature – for example the crocodile suggests that you should snap your teeth whereas the kangaroo suggests that you should jump and bump! At the end of the book the little girl decides that the best way to show that she is happy is to do all the things that the animals have suggested – all at once! I like this book for a number of reasons. Most of it is written in the same verse form as the popular song which means that as well as reading the book you can actually sing it too – even with a voice as bad as mine as my daughters are very forgiving! Also, children can physically join in with the action which is a lot of fun. My daughters particularly like the gorilla’s suggestion and take great delight going around beating their chests! Unfortunately the parrot’s suggestion to screech is also a great favourite too! There are only eight different animals referred to in the book so something we love doing as a result of reading it is to make up our own verses about different animals which can go on forever and ever! We have made up verses about cats purring, pigs grunting and horses galloping! There are so many different possibilities that are all so much fun! The pictures in this book are wonderful – very vivid and colourful and all the animals are given very distinct features. All the pages are very colourful and there is a good degree of humour in all the pictures! ‘When you’re happy and you know it do your thing. When you’re happy and you know it smile and grin. No Comments on "If You’re Happy and You Know It"